When you land at Otopeni Airport in Bucharest, a member of our Romania team will pick you up and take you to Brasov. This two and a half hour journey through the Carpathian Mountains is stunning; at times you’ll wind through forests and pass horse carts pulling their load along the road. Not only will you see the countryside and historic buildings such as Sinaia Palace, but you’ll learn about the country's history, its people, and what you might expect during your stay in Romania. 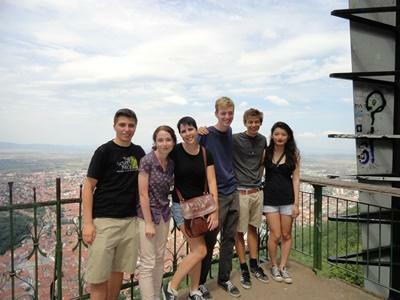 After a night at your new accommodation in Brasov, you’ll be picked up by a member of Projects Abroad staff for an introduction to Brasov and life in Transylvania. Brasov is a small city and you’ll learn how to get around on the bus network. You'll be shown internet cafes, banks, the post office, and how to find our office. The following day you will be taken to work and introduced to your supervisor. During this meeting your schedule and working hours will be arranged and you’ll have the chance to ask questions. Some volunteers are able to walk to work, however others need to take a local bus. If you do need to take a bus you will be shown where to catch it. If you are volunteering on a Standard Project, all necessary work-related transportation costs will be covered by Projects Abroad. 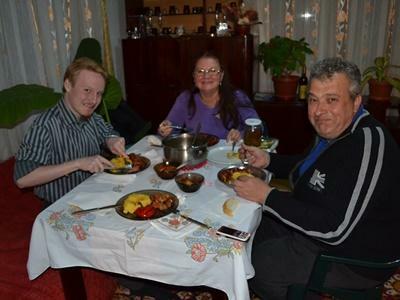 All volunteers in Romania live with local host families. Romanians are extremely friendly and will be eager for you to share in their traditional food and drink. A typical Romanian meal may consist of a shot of palenka, followed by a bowl of ciorb (soup) that is served with a dollop of smetlana (soured cream). You may then have some ardei umpluti (stuffed peppers) or sarmal (cabbage leaves stuffed with meat and rice). Loved by some and hated by others is 'm m lig' - a corn porridge often served with goats cheese. For dessert you are likely to have apple or cherry turnovers. Traveling opportunities in Romania are great - especially with the use of the excellent train network. In and around Brasov itself you may like to visit the birthplace of Vlad the Impaler (Dracula), or the beautiful medieval town of Sibiu. There is also Sighisoara, a World Heritage town, and the area around Iasi (pronounced 'yarsh') with its stunning painted churches. Don't forget Bucharest, and, in the hot summer, the popular beaches and resorts on the Black Sea.